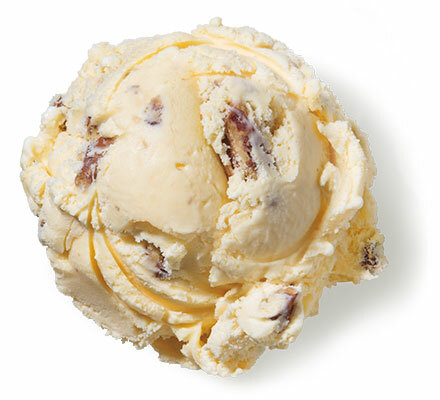 Creamy butter pecan no sugar added reduced fat ice cream. 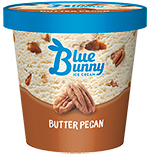 Ingredients: Skim Milk, Buttermilk, Polydextrose, Whey, Maltitol, Cream, Maltodextrin, Pecans (Pecans, Cottonseed Oil, Butter, Salt), Milk, Contains 2% or less of Natural Flavor, Propylene Glycol Monoesters, Mono and Diglycerides, Guar Gum, Carob Bean Gum, Carrageenan, Cellulose Gel, Cellulose Gum, Acesulfame Pottassium, Salt, Vitamin A Palmitate, Sucralose, Annatto Extract for Color. Excessive consumption of sugar alcohols may have a laxative effect in sensitive persons.